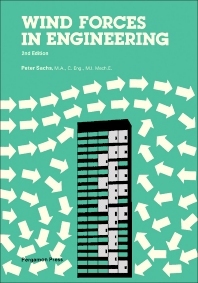 Wind Forces in Engineering, Second Edition covers the various aspects, principles, and engineering applications of wind forces. This book is composed of 10 chapters and starts with an introduction to the history of wind forces. The subsequent chapters consider the wind speeds for various topographies; particular "shape factors" for general and special structures; oscillatory wind forces of a random or single-frequency type; and the dynamic response of structures to oscillatory wind forces. Other chapters deal with specific structures, such as buildings, bridges, towers, radar antennas, for static and dynamic wind loadings. The final chapter provides the Code of Practice which has been republished since 1972, including those for Australia, Canada, Great Britain and the U.S.A. These codes do not provide similar responses and are all essentially in a transitional state between the old static force concept and an improved statistical analysis to be based on more experimental evidence. This book will prove useful to engineers and researchers.